This is an enjoyable episode. Loved the banter between Arthur and Terry and a decent storyline. Contains the great phrase "Lloyd it" when trying to re-enter the flat. The slang is Lloyd George - forge. To use an instrument to replicate a key was known as forging a lock. Basically picking the lock. 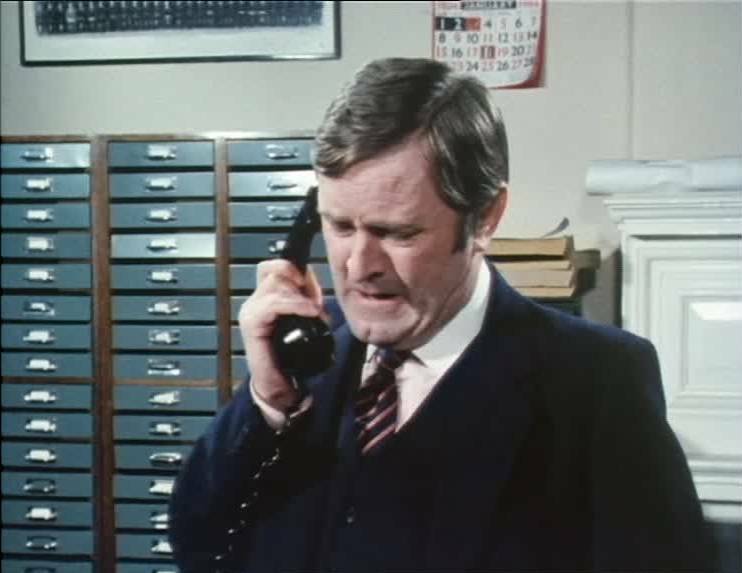 I have the script for this one and its down as: Terry - "You cant 'Loid a mortice Arthur" and 2 things I've just noticed (on checking it) - one is that I'm sure Terry says "Don't be silly (or stupid) Arthur you can't....etc) in the actual ep (?) so may be a bit of ad libbing by Terry left in....and it also seems as though the director (RWB) put the apostrophe just before the word "loid" in by hand, meaning an abbreviation? I'm sure someone suggested its short for celluloid...where you use a bank card or similar to open a Yale type lock? Bizarrely its also a term used in the USA it seems....as a few years ago I came across almost the exact same phrase, including the term 'Loid' in a Dean Koontz book! Thanks for that VAT. I vaguely remember seeing the discussion on the old forum. The Lloyd George explanation came from an old boy in the pub who you'd have money on having form in the dim and distant!! Lloyd seemed to make sense given the more localised slang used in Minder but as you rightly point out (cellu)Loid would seem to be logical answer given the script. Well you learn something new every day - cheers! No problem arnie. Can't say I've solved it for sure but I personally think its about the fact the you cant slip a flexible card into a door that is mortice locked. Maybe wrong though! Cheers, VAT. Watched this tonight as it is one of my favourites. Will keep an eye out nixonuk! Nice blooper I was made aware of recently - watch carefully around 11 minutes as Charlie enters the flat for the first time (while Terry is downstairs). As Charlie passes the dining table there is a fruit bowl, place mats and a salt & pepper set on the table as he goes into a back room. When Charlie reappears from the back room in the next scene the table is now empty! Watched this for the first time last night. Best episode yet! So funny, quite a bit of swearing, Terry's hair looks worse then ever although it is shiny. Studio lights must have bounced off it. I watched some of this the day on ITV4 when it was actually "bleedin freezing" and I thought I'd end up next to the fish fingers in Bejams. This is great episode with a good plot and lots of characters (Billy Murray, David Warbeck, the cornermen) to liven up the show. This is more like it! 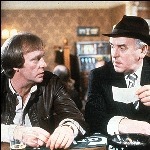 After the disappointing previous episode it's good to see Minder looking like its old self. The opening scene is one of the best in the series and gets the episode off to a great start. My American ears enjoyed all the slang flying fast and furiously! I really liked the Arthur-Terry banter at the police station. A very good episode and one to add to my list of favorites. This is a good episode. Well crafted and everyone is good in it. Just watched it again on ITV4. I would have thought the reference to 'Lloyd it' was for using a Lloyd's bank card on the lock. I can't see any other explanation as fitting that era. I am sorry I didn't watch out for the bloopers mentioned above but I noticed another one. When the action shifts from outside the shop where Rycott first confronts Arthur and goes back to the Winchester Arthur's suit changes from pin stripe to brown. I watched it before I went to work this morning, a quality episode. I have to check something out as I spotted a name of one of the crew in the closing titles who I work with, but not directly. Not a name you would hear much, so am very intrigued! I know the ITV4 cuts can be frustrating, but it does set you up for the day, no matter how many times you have seen it. A bit of a clue on the filming date for this one, the calendar behind Rycott definitely looks like 18th January 1984 to me. down hill with a following wind behind & DIDN T come in beige ! - but did have RED seat belts !!! Very good episode. You can always rely on Tony Hoare to come up with the goods. Picture Quality's a bit of a grainy one. Great to see Rycott and Melish again, this was only Rycott's 7th appearance. Great episode this - the scenes between Arthur and Terry where they fall out are brilliant and really show the acting skills of the two leads. 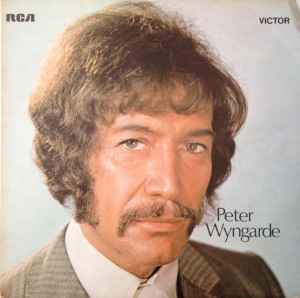 For all that though, this episode is a Peter Child's tour de force. It shows how, like Chisholm, he's obsessed with getting Arthur banged up. The scene at the end where he's shouting at them as they leave while the rest of the nick watch on is superb. Best line goes to Arthur though where he's being interviewed by Rycott. "Do you take me for a complete idiot?" "Not a complete one, no". One of the best of series 5 for me. I took it to mean using your Lloyds bank card on the Yale lock! A truly great episode that gets better each time I watch it. A good episode I would think. Turn out very well. The police's reaction was very comical. Just watched this episode for the first time in years, really enjoyed it. Was quite impressed by the guy that played Mr Collins; tall, handsome actor with a well to do accent - he had real screen presence. Suspected he’d have done more than just an episode of Minder in his career. 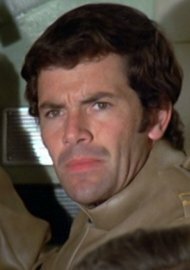 Turns out he, David Warbeck, was an action & horror film actor appearing in numerous European movies in the 60’s and 70’s, and for a time was seriously considered as a possible James Bond, being first reserve to replace Roger Moore. However Moore held onto the role longer than studios expected and Warbeck became too old in the meantime, eventually losing out to Timothy Dalton. Warbeck died of cancer in 1997, aged 55. David Warbeck also played schoolteacher Anton Hoffer in Hammer's Twins of Evil (1971) with the great Peter Cushing and the Collinson twins!